This morning I had eggs, bacon, and grits. It’s a Susannah Mushatt Jones type of breakfast. And since she lived to 116, it must be a good way to start out every day. Do you like grits with butter, salt, and pepper or with sugar? 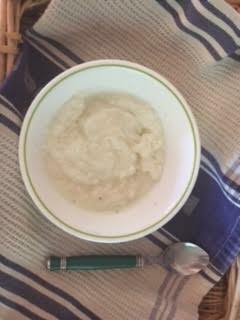 If I’m going to eat a hot cereal, Cream of Wheat and sugar sounds better to me. However, I remember eating rice as cereal (with sugar and milk) when I was little. Then my family moved to the Gulf Coast where people eat rice for just about every meal except breakfast. They serve the rice with gravy. I got used to eating it that way and stopped having rice for breakfast. My mother seldom cooked rice. She preferred cooking mashing potatoes or cooking them with a roast. She started cooking Irish and sweet potatoes along with carrots and onions with the roast. There usually was plenty for leftovers. Mother’s roast was the best, so good that mine doesn’t ever taste the same. But she had a huge pot to cook it in. The difference between her roast and mine could have been the seasonings, or maybe it was the pot. It could have been a combination of things. Or maybe it was just her touch. Whatever the case, she chose potatoes over rice. Imagine eating eggs and bacon with mashed potatoes or rice. It doesn’t sound too appealing – unless you use hash brown potatoes. I enjoyed them with the grits. But then, I’m a southern gal. Here’s the recipe I tried out today. Thinking about trying it? Let me know what you think. Prepare grits according to the box directions (microwave or on the stove). Fry the bacon, then fry the eggs in the bacon grease.. When the bacon is done, drain the grease by wrapping the bacon in a paper towel. Pat the eggs with a paper towel to soak up any grease from the bacon. Put a slice of butter in the hot grits. Now tear the bacon in bite-size pieces and put into the grits. Place one fried egg on top of the grits and bacon, and you have a meal. Sprinkle as much as you like of the Greek no-salt seasoning (or use salt and pepper). Eat the other egg by itself or put both eggs in the grits. I had grits with bacon this morning, too. I didn’t have the egg, though. Do you add salt when you cook the grits?